Criminal justice sciences students share their research experiences at Stockton University. Recently, four criminal justice sciences majors presented an overview of their research projects developed as part of a postgraduate course in victimology, victim assistance, and criminal justice held at Stockton University. Other co-directors from Stockton University included Janice Joseph, distinguished professor of criminal justice; Deanna Button, associate professor of criminal justice; Guia Calicdan-Apostle, associate professor of social work; Jess Bonnan-White, associate professor of criminal justice; and Kim Shanz, assistant professor of criminal justice. 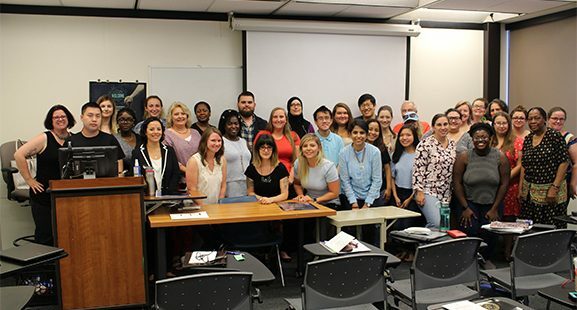 The students that participated in the course at Stockton University included both graduate and undergraduate students, who had positive testimonies about the time spent at Stockton University. It is always a great experience to go beyond the walls of your traditional institution to get a wider perspective. “My time at Stockton was great. It was a wonderful experience to meet with students and teachers from across the country and across the world. I was also privileged to lend my knowledge and experience as a 16-year veteran police officer with the other students.” Amanda Street said. “I enjoyed speaking with the presenters from Germany and Canada about the differences in our criminal justice systems…it was also interesting how some problems and/or issues are similar around the world,” she said. Franklin Chang, another criminal justice graduate student whose research is on the secondary victimization of sexual assault, expressed satisfaction from learning more about different fields like green victimology, victim assistance in post-genocide countries, psychological perspectives of victimology, and race-based victimology. “These different fields opened up a new world of new ideas to explore. The visit to the Holocaust museum was fascinating and put in perspective the massive implications of the genocide,” she said. Maggie Matlock, an undergraduate student at Illinois State whose research is focused on xenophobia: victim services and the criminal justice system, thought Stockton University was as familiar as ISU. “At Stockton, I was able to quickly adjust and find the material I needed to conduct my research,” she said. Speaking about her research on xenophobia, she found so much material that she found so much information from a global perspective. “The globalization of the crimes of xenophobia are far-reaching and it was interesting to see some of the commonalities between completely different cultures,” she said. “Yet, each place was affected by the violence and hatred from xenophobic mentalities and behaviors.